Asteroid Institute Mission Director Harold Reitsema recently presented at the National Academies of Science on the work that B612 has done on space-based asteroid observation missions. The National Academies of Sciences has been tasked to explore the capabilities of space-based telescopes, including exploring the relative advantages and disadvantages of Infrared (IR) and visible observations of near Earth objects (NEOs) and reviewing and describing the techniques that could be used to obtain NEO sizes from an infrared spectrum and delineate the associated errors in determining the size. The National Academies invited Dr. Reitsema, along with other scientists, to present to the study committee investigating this question. B612 has made a strong case for the value of a space mission to increase the catalog of known near Earth asteroids (NEAs) since 2010. 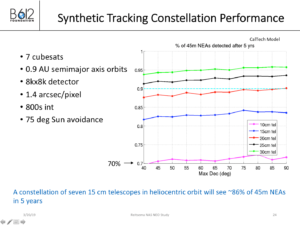 Dr. Reitsema presented the work that B612 had previously done on the Sentinel infrared space mission as well as on the potential future of a constellation of small satellites to augment the work of the ground-based observatories such as LSST. 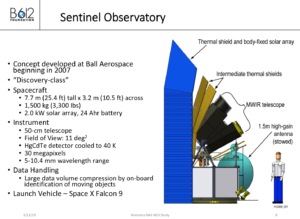 Dr. Reitsema showed B612’s growing expertise on what a constellation of satellites could achieve as well as the knowledge learned during the planning stages of the now-canceled Sentinel Mission. The committee will present its report to NASA later in 2019. NASA is expected to use this report to evaluate the best means of increasing our catalog of NEAs and our understanding of their characteristics, both critical to the goal of planetary defense. NASA has been studying near Earth asteroids for many years through ground-based telescopic studies, studies of meteorites, and space missions such as the OSIRIS-Rex mission currently at asteroid Bennu. Ground-based telescopic observation makes about 2000 discoveries of NEAs each year, a small dent in the total of over three million NEAs that could present a threat to Earth if they were to impact. This rate of discovery will increase dramatically with the start of operations of the Large Synoptic Survey Telescope in 2022. Dr. Reitsema is a planetary astronomer with more than 30 years experience specializing in the design and building of interplanetary spacecraft and astronomical imaging detectors. 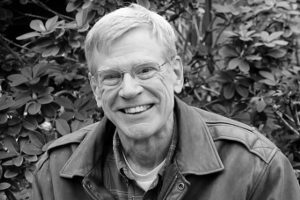 He has led design and engineering teams for many missions, including the Hubble Space Telescope, and has published more than 50 astronomy and planetary science papers. Asteroid 13327 Reitsema is named after him in recognition of his contributions to planetary science.